Although rice terraces wind their way around mountains throughout China, the Longji Rice Terraces are considered to be the most magnificent of them all. 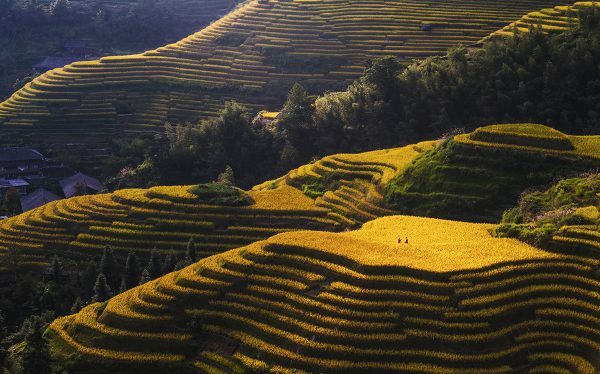 They are located in Longsheng County, about 100 kilometres (62 miles) outside of Guilin, and are sometimes referred to as the Longsheng Rice Terraces. The word “longji” means “dragon’s backbone” and these rice terraces earned their unusual name because the terraced fields climbing up the mountain look like dragons’ scales whilst the summit of the mountain range resembles a dragon’s backbone. This gives you an idea as to the sheer scale of these rice terraces. These terraced fields were all manmade and were first built during the Yuan Dynasty (1271–1368), although many of them weren’t completed until the Qing Dynasty (1644–1911). The majority of them were built over 650 years ago by the Zhuang and Yao ethnic minorities, and are still in use today. They stretch from the riverside right to the summit of the mountains, ranging from between 300 metres to 800 metres above sea level. In some cases, the terraced fields reach heights of approximately 1,100 metres above sea level. They cover a colossal area of 66 square kilometres (25 square miles), which is about three times the size of London Heathrow Airport. The rice terraces were initially designed to make use of land that was previously thought too difficult to plough. By flattening small surfaces of the mountain, farmers were able to plough them and, via a particularly ingenious irrigation system, pump water into the ploughed fields so that rice could be grown there. This method is still widely used by farmers to this day and the Longji Rice Terraces are no exception. The rice terraces are farmed by the people of Ping’an Village, Longji Ancient Zhuang Village, and the Jinkeng cluster of Red Yao villages. This means that, no matter what season you travel to the rice terraces, you’ll be met with a unique and beautiful sight. When asked which season is the best to visit the terraces, most locals will respond by saying every season is the most beautiful. In spring, the terraced fields are flooded with water in preparation for the planting of rice seedlings. The crystal clear pools glitter up the sides of the mountain and reflect the flawless blue skies and wandering clouds. In summer, the rice stalks have begun to grow and the mountains are awash with verdant greenery. The lush jade hues of the rice terraces as they trickle down the mountain are amplified by the warm sunlight. In autumn, the rice stalks have turned a golden-brown and are ready to be harvested. The mountains look as though they have been plated with pure gold and rival the magnificence of Beijing’s Forbidden City. In winter, the terraces are left to recover and are covered in a thin blanket of snow. These snowy ribbons running along the mountains resemble white dragons racing each other upstream. We recommend you plan your visit to the terraces around the seasons so that you get the view you most desire. The terraces are open year round but you do have to pay to enter them. There are three main entrances to the rice terraces: one at Ping’an Village, one at Longji Ancient Zhuang Village, and one at Dazhai Village, which is part of the cluster of Jinkeng villages. From there, you will be given a small pamphlet about the rice terraces and a rudimentary map of the various hikes you can take along them. Most of the paths are well signposted, so you need only follow the maps displayed at various intervals if you happen to lose your map. If you’re still feeling unsure about the hike, you can hire a private guide or, in some cases, there will be some older local women waiting at the entrance who can speak enough English to act as your tour guide. The hike from Ping’an to the summit takes about 2 hours but the hikes from the Jinkeng cluster of villages can take slightly longer. If you’re feeling adventurous, you can even hike from Ping’an to the Jinkeng villages, which takes about 3 hours. If you plan on spending longer than a day at the rice terraces, then there are some more advanced hikes that can take several hours and will reward you with access to the less tourist oriented parts of the mountains. However, if you plan on taking simply a daytrip to the rice terraces, you need to plan carefully as the last buses to Longsheng leave around 4.30pm, so it is recommended you aim to leave the scenic area by about 3pm. If you’re having trouble choosing which villages to visit, there’s no need to worry! 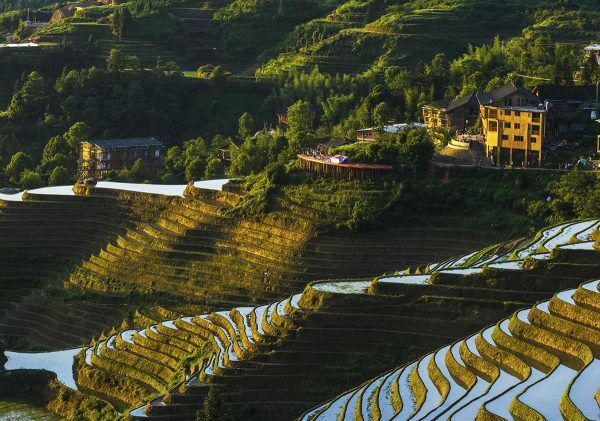 We’ve dedicated a group of articles to describing the benefits and pitfalls of each of the villages that give access to the rice terraces, from the larger village of Ping’an right through to the small Red Yao village of Huangluo.